Not Roasted or peeled. New Mexico Green Chile dried and ground. Great as a seasoning! Now available in both Mild and Medium Hot heat levels! I am from NM and now reside in Florida. I cannot get good flavorful green chili here so on my last trip home I heard about the Chili shop. 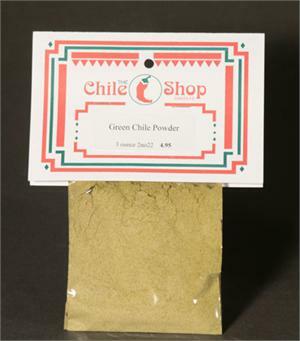 As soon as I got home I ordered Green chili powder. I love green sauce and this is amazing. It adds my favorite flavor and I can keep it fresh in the freezer. Nobody in Florida ever heard of green chili powder. I would recommend this to anyone who loves green chili. It is a top quality product and I keep it on hand at all times. I still love my Mexican food. I can order enough to last for a full year. It is very flavorful and easy to use in soups and sauces.